There are more than a 101 million Amazon Prime members in the U.S. If you want the best visibility with this too-big-to-ignore shopping group, you have to meet Amazon’s rules for Prime status. And the easiest way to do that is to let the rule-maker do the work, using Fulfillment by Amazon (FBA). Once you’re using FBA though, you may discover that the easy path comes with some perils of its own. About three months in, Amazon will review your relationship and give you a score called an Inventory Performance Index (IPI). For them a good relationship is one where you have lots of orders going out, you don’t have too much inventory and you’re never out of inventory. A business needs to have an IPI score of 350 or above for Amazon to be happy. Those sellers with a score below 350 will be asked meet additional requirements (read: pay fees if you don’t increase sales or reduce storage). Amazon inventory penalties are in addition to Amazon’s rates to store, pick, pack and ship your products, making it very hard to predict fulfillment costs. Amazon sellers can pay as much as $1,000 per pallet per month in Amazon penalties alone. Most often, you’ll see these services called “FBA Prep,” or the company will call itself an FBA fulfillment center. FBA Prep gives you the best of both worlds: the service of a fulfillment company devoted to making things easy for you and Prime status on Amazon. Your third party logistics partner (3PL) should have experience with Amazon regulations. As with every step of its processes, Amazon has set, specific requirements for labeling inside and outside of the carton. And there are bundling requirements as well. A reputable FBA Prep will have experience with these regulations and be able to adapt every one of your packages to Amazon’s specifications. Missing or erroneous information on the shipping label: Amazon reference IDs, shipment IDs, SCAC codes, etc. Look for a FBA Prep fulfillment center that provides clear, easy-to-understand pricing for FBA Prep services. Ask about long-term storage fees, order minimums or SKU maximums, right at the start, so you don’t wast time with a company that leverages the penalty fees you’re trying to avoid. Of course Amazon isn’t your only selling platform. In our multichannel world, you have orders from eBay, Walmart and your own website to consider. Amazon does allow you to fulfill these orders from its warehouses—at a price and not necessarily a cost-effective price. The first step in reducing your FBA penalty costs is inviting your fulfillment partner to be a shipper. Use the Amazon Supply Chain Connect Tool and select them. Once you place the order to replenish your Amazon inventory, they will get an email. At that point, your FBA fulfillment center will produce and apply labels properly, use approved shipping companies, and check for any other Amazon requirements for that shipment. Every shipment can have different requirements. Already Using FBA and Need to Reduce Stock? Perhaps you’ve already been hit with excessive inventory fees, or long-term storage fees, or both! You’ll need to reduce the inventory at Amazon to get under your inventory limit. Removal orders will cost $0.50 (oversize is $0.60) per item and can take up to 30 days during the holidays or other peak months like February, March, August or September. However, just sending the removal order will halt those penalties, while you wait for Amazon to collect and ship your inventory. FBA is a smart choice for sellers looking to take advantage of Amazon’s systems. 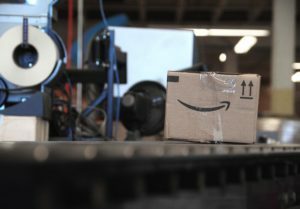 In an effort to stay out of the storage business, Amazon discourages slow-moving inventory, making a case for FBA Prep fulfillments centers to step in. Read more about FBA Prep.